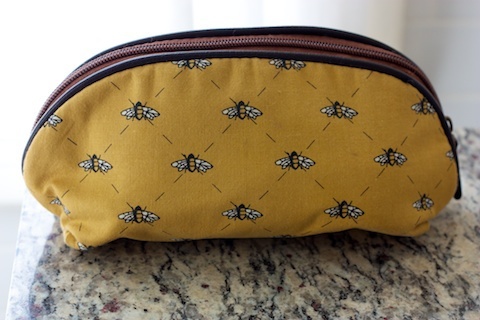 This is my smaller make-up bag that contains the things I use on a daily basis. I’m a pretty simple lady and like for my make-up to look really natural for everyday wear and this bag includes those products. 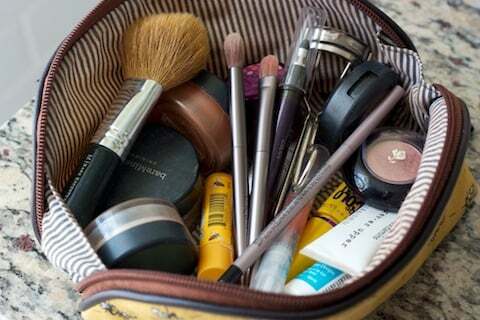 I have several other make-up bags with items that I use every once in while (like when I’m going out dancing) but those items aren’t included here. Bare Minerals Foundation, Warmth, Mineral Veil and brush – When I first starting using BareEscentual products (over 5 years ago) I thought they were more natural than regular make-up because of the name. I now know that that’s not the case, so next time I need foundation I’ll most likely try AfterGlow, a natural brand of mineral make-up. But, I really like the Bare Minerals foundation and the warmth – which gives me a nice glow similar to what a blush would do. I don’t use the Mineral Veil that often but I like it when I do. Benefit erase paste – Great for concealing under the eyes. I use this every day. Burt’s Bees lip balm – This is my favorite chapstick! I have around three tubes at all times – one in my make-up bag, one in my purse and one on my bedside table. Urban Decay eye make-up brushes – I’ve found that good quality brushes are definitely worth the money and these Urban Decay ones are great. Tarte eyeliners – smolderEYES and emphasEYES – Tarte is an awesome natural make-up brand. I like the smolderEYES eyeliner okay, but the empahsEYES is my favorite. It’s for the inner-rim of your eyes, which is where I like to where my eyeliner. It works better than any other eyeliner I have ever used. Stila Lip Glaze – I bought an 8 pack of these lip glosses from Ulta and love them. Mac eyelash curler – My friend convinced me to buy this a few years ago and it’s quickly became one of my favorite make-up items. I have pretty long eye lashes already so sometimes I skip mascara and just use the curler. Maybelline Volum’ Express Colossal Waterproof mascara – I’ve used Maybelline mascara for years and really like the way it works. I would like to switch to a natural version though. TheraTears – Looking at the computer all day creates dry eyes and my eye doctor recommends this brand of eye drops. Eye rev-er-upper – an eye brightener that I use before I put on the erase paste concealer. Pacifica Mediterranean Fig solid perfume – I bought this a Whole Foods and love it. It smells fresh and lasts a long time and Pacifica skin care is made without animal testing, animal bi-products, phthalates, parabens, sulfates, propylene glycol, benzene, GMOs, mineral oil, peanut oil and triclosan. All Pacifica products are cruelty-free. So there you have it, my natural and not-so-natural make-up products. Like I said, moving to all natural products is a work in progress and I’m still working on it! Speaking of make-up, I need to go put some on because we have a wedding to attend tonight! So excited!!! 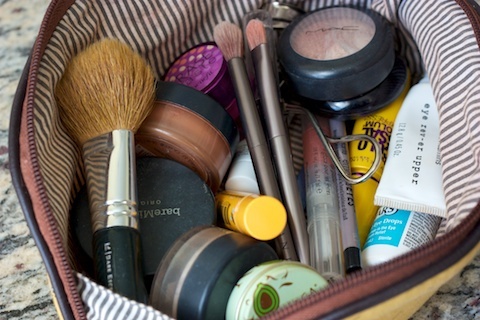 Do you use natural make-up products? What are your favorites? 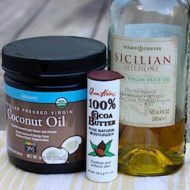 I’ve been trying to switch over to natural beauty products as well but my skin doesn’t like a lot of them. I think I’m stuck with chemical-y face wash, moisturizer and powder concealer but everything else I’ve got all switched. 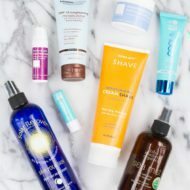 I have been using natural beauty products [mostly] for awhile now! Especially face wash, toner and cleanser! Bert’s Bees is AWESOME and I understand your want to switch to a natural mascara, but honestly, I think they’re hard to find! Have you ever tried Yes To Carrots or any of the other Yes To lines? They are a natural, cruelty free and don’t contain parabens, petroleum, or SLS. Plus, they are fun and quirky. love bare! 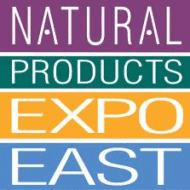 we have tried some more natural brands but skin did not like it. so back to bare. loved seeing what you use, you always look amazing! Cute bag! I’m a Clinique girl. I’m all about their “bonus time” offers. I love the Arbonne line of products. They are swiss formulated and botanically based, with the motto of being pure, safe and beneficial. They are only available through an Arbonne consultant though, but one can easily be located via the Arbonne website. Awesome post! I am the same way … I am trying to use up some of my older stuff before I get some more natural stuff! Great post! I have been looking into mineral powders (like Bare Essential) for a more natural makeup option. Afterglow looks like a great product. Will definitely look into it further. Oh, I just saw that someone else mentioned Say Yes To…I love their moisturizer..Say Yes to Carrots!!! I like Bare minerals, bot now in Europe we have got Lily Lolo,and there are without talc. For me much better:) Maybe you will have chance to try it.